Hi from New Zealand's South Island! Picked up a new (to me) 986 3.2 S 6 speed on Friday with 50,000 miles on it and happy to be playing with the big boys now. Did my "apprenticeship" in MGBs (and a brief dalliance with a Mazda MX5 - or Miata to you lot in the northern hemisphere) and still have a Gen 6 VW Golf GTI with 6 speed DSG for some hardtop fast fun. Very glad to have a drop top roadster again but just a little sad that there is NOTHING the Boxster needs doing to it as it is immaculate and I'd swear it was only 4-5 years old. Better images to come after I have detailed and polished it properly. I did just spend about $300 on a dust cover, clay bars, scratch remover etc etc and I really should have the bonnet resprayed to remove the road rash so I guess there are things to do! If you are looking for another project and the back to black does not work on the piece under the windshield replace it. Mine wasn't looking so hot and it ended up getting a crack. I was pleasantly surprised by the cost. About 130 USD. Hopefully parts are reasonable in New Zealand. Congrats! I am also a new owner of a black 986S. 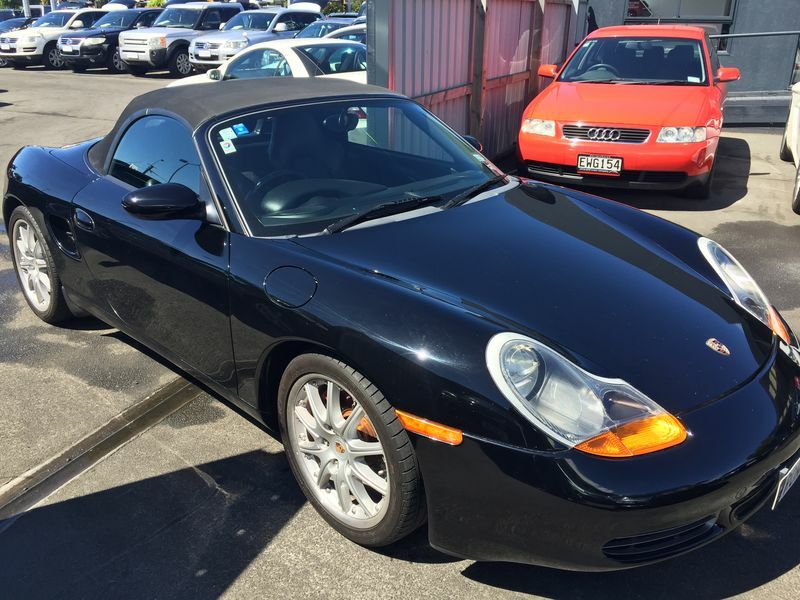 Here's hoping for many happy (and relatively inexpensive) miles in your new Boxster. Any pics yet? Ok, time for some retractions as it turns out that there WILL be work to do on her! It looks like she hasn't been driven over 60kmh in a long time as, even though she passed her PPI, she has since developed a knock in either the steering or the suspension (control arms, shocks?) after being driven for an hour or two at highway speed (only heard at low speed) plus she is leaving a little oil on the garage floor now. I think a seal/gasket of some sort (RMS, spark plug etc?) has opened up after the revs went over 3000rpm for the first time in years. Still drives beautifully and engine pulls and sounds like new so hopefully nothing too serious. Dealer purchased vehicle so not really my problem - just a little annoying as it will have to go back to be rectified.